We drove up higher and higher following the river… river disappeared between thick of pink Oleander bushes, appeared and was gone again from sight…Landscape changing to open spaces and fields of wheat, soft and dreamy beyond which high rocky mountains appeared as we kept on driving upwards towards those Rocks. The heat subsided, cool breeze began to blow. We stopped beneath the Rocks at The fountain and filled up our bottles with fresh cool water flowing from it’s depths. 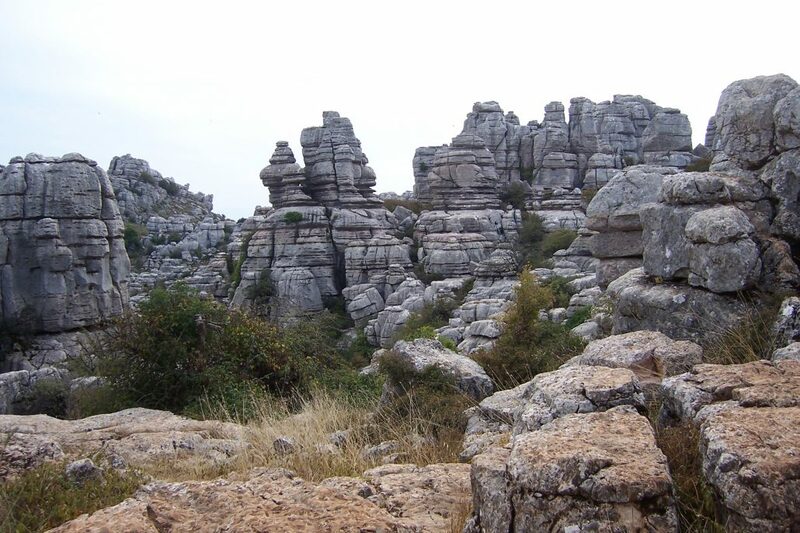 We entered “EL Torcal” and climbed ever higher between those crazy shapes formed over billions of years, forming, reforming through times beyond our human scale. We have climbed a couple of hundred meters higher and feel the cold. We freeze and shiver at 15 degrees less. We are fragile creatures with immense powers of the “Will”! The astronomer sets up telescopes. We sit around, are mesmerised as we listen. He points to stars with his laser pointer…Recites their given names from ancient times of men to new, also their constellation tales we humans have conjured. We queue to watch saturn, our potted moon, and distant stars which may no longer be as it’s light years taken for us to view…. beyond our comprehension. We Wow and clasp at moments of AWE! We are feeling cold and tired. We pack up and drive back to our warm rooms, slumber to sleep and dream of plans of grandeur for days to come! !